In preparing for our trip, I have been making lists of everything we need to be sure to bring. Since we are downsizing and moving into an RV, we can only bring the essentials. Something that is high on the essentials list is a first aid kit. We will traveling with 3 young kids and a dog (and a dad who thinks he is a kid..), so we have to be sure to be prepared to treat any kind of injury. So I came up with a first aid kit checklist for our family. 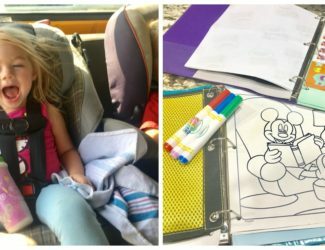 We do road trips fairly often with the kids, and to be honest, a first aid kid hasn’t always made it in the car. I have no clue why not. It should always be included. This post may contain affiliate links. Please read our full disclosure for more information. When I used to pack for horse shows we always had a complete first aid kit checklist for the horses and the people. And since I was in the United States Pony Club, that first aid kit was ALWAYS checked and updated. We would get points docked off at shows if it wasn’t. So I am not sure why I don’t have a well organized first aid kit at the house and one for the car. 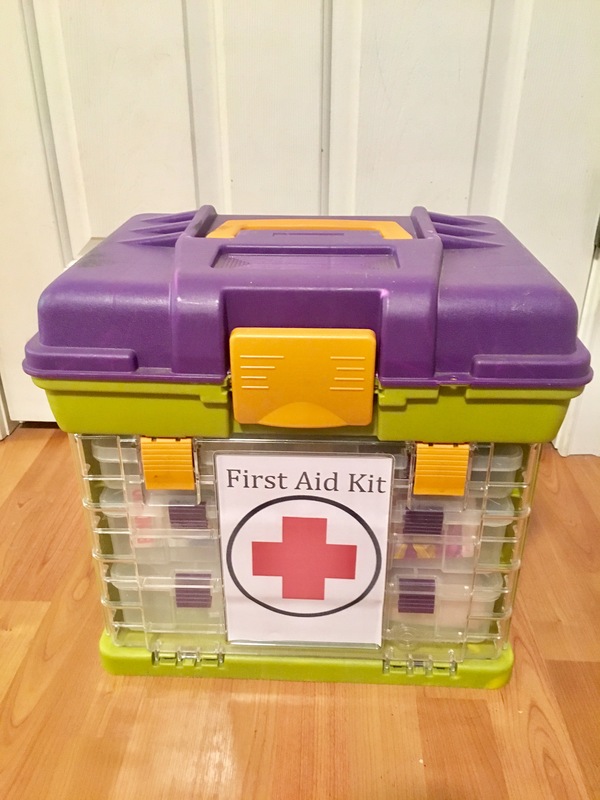 Between my Pony club roots, growing up with a nurse as a mom, my personal trainer emergency CPR training, and my being a mom for 4 years now, I should have a first aid kit with us all the time. But I haven’t for every trip, or even every day. I put together a kit for our long trip using this first aid kit checklist. 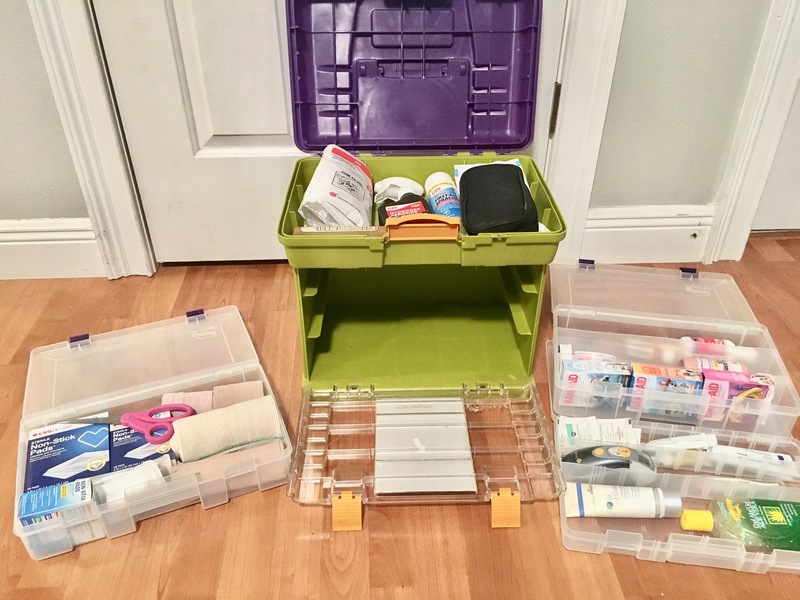 I used this 4 Drawer Grab ‘n Go Organizer to put everything into. Below is what I came up with for our first aid kit checklist for traveling with kids (ages 4, 3, and 1). I started with the American Red Cross first aid kit checklist, and added to it for the kids. YOU CAN DOWNLOAD A PDF COPY OF THE FIRST AID KIT CHECKLIST HERE This will also subscribe you to our decluttering tips and U.S. trips newsletter. We promise not to crowd your inbox and you can unsubscribe at anytime. I added more bandaids than just the 25 recommended by the Red Cross, because of the above mentioned kids. Band-aids help a lot more than scrapes. They help bumps & bruises compliments of a sibling, stubbed toes from kicking a rock at your brother’s head, and they can help a penguin Beanie Baby feel better. If you have kids, you need lots of bandaids. You may be curios as to why I have essential oils on the list. Or maybe you aren’t because you already know the healing properties they have. They can help with a plethora of ailments so I have to include them. They are actually my first line of defense before I go to the medicines. I would consider myself a little ‘crunchy’, I like natural remedies when possible. This all stemmed from a period in my life when my body was all out of whack 8 years ago (I believe a big contributor was taking birth control.) After 3 years of going to doctor upon doctor and no one was helping me. I finally was able to get my body back in check from good nutrition & using nutritional cleansing, and using acupuncture. So during that 3 year journey I discovered a lot of natural remedies. Only in the past two years have I discovered the world of oils. I have to clarify that I still believe in Western Medicine. We use it and I know it has helped so many people. I just personally think medications are over prescribed and used. I believe preventative and natural medicine is not looked at enough. I know oils are super popular right now, and are really for good a reason. Here are my top 10 list of essential oils to include in a first aid kit. These go with us on most every trip we take, even when I have forgotten the full kit. 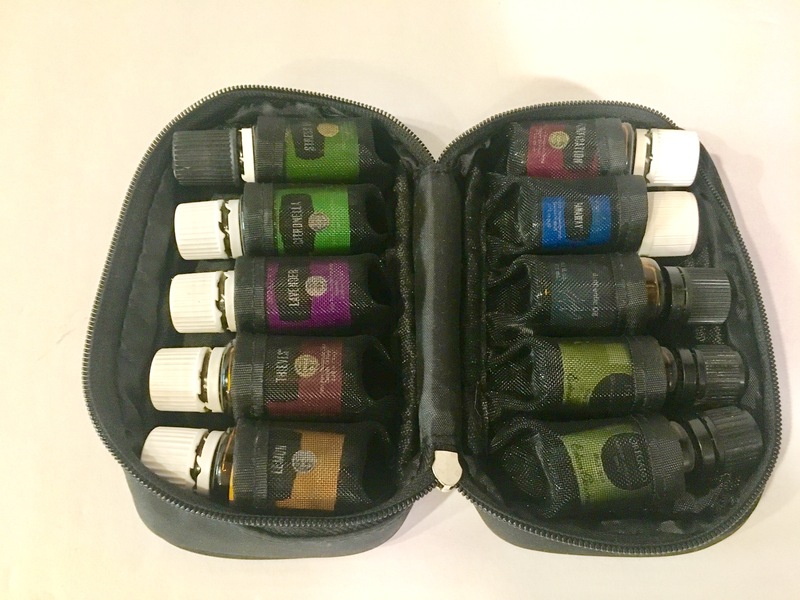 I love using my Essential Oil Carrying Case for traveling. You can grab the 11 oils in a PDF HERE. This will subscribe you to our email list of decluttering tips and USA trips, and you can unsubscribe anytime. Uses- Respiratory infections, muscle/nerve pain, digestive/intestinal problems, anxiety, skin problems, (acne, eczema, oily skin), skin-penetration enhancer 1. Uses- Respiratory infections, high blood pressure, arteriosclerosis, menstrual problems/pms, skin conditions, burns, hair loss, insomnia, nervous tension 1. Uses – Circulatory problems, arteriosclerosis, obesity, parasites, urinary tract infections, varicose veins, anxiety, hypertension, digestive problems, acne 1. Uses – Arthritis, rheumatism, respiratory infectious diseases, infections, tuberculosis, digestive problems 1. Uses – Rheumatism/arthritis, respiratory infections, obesity, viral infections (herpes simplex, herpes zoster, cold sores, human pappiloma virus, etc), fungal infections/candida, digestive problems, headaches, nausea, skin conditions (itchy skin conditions, scoliosis/lumbago/back problems 1. Medical Properties – Powerful antibacterial, anti-fungal, antiviral, antiparasitic, anti-inflammatory action. Uses – Fungal infections (Candida, ringworm), sinus/lung infections, tooth/gun diesease, water retention/hypertension, skin conditions (acne, sores) 1. The following oils are blends of several oils. 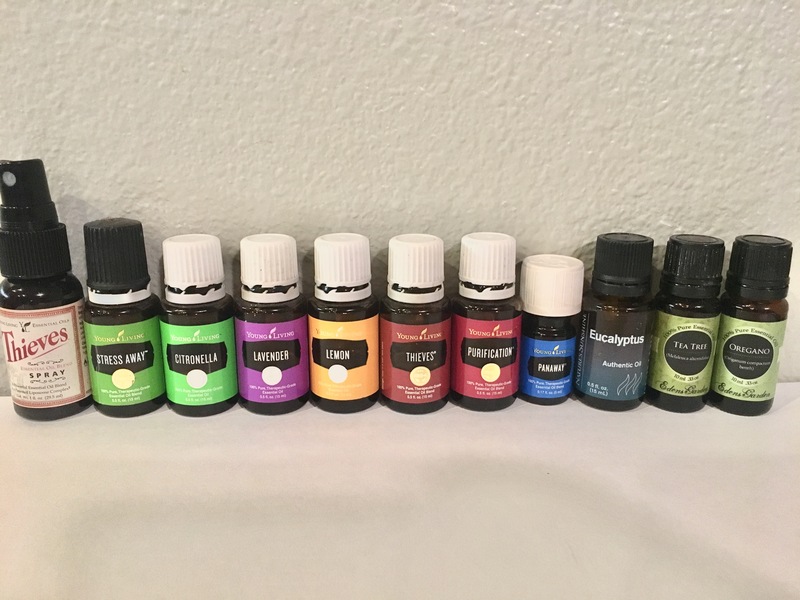 These blends below are ones created by Young Living, but there are several other ones out there that have good blends. As someone who likes working out, I LOVE Panaway for sore muscles. It’s basically a natural IcyHot. It feels so good on sore and tight muscles, and I love the wintergreen and peppermint smell. Uses – Reduces pain and inflammation, increases circulation, and accelerates healing. It relieves swelling and discomfort from arthritis, sprains, muscle spasms, cramps, bumps, and bruises 1. Uses- Cleanses and disinfects the air and neutralizes mildew, cigarette smoke, and disagreeable odors. It disinfects and cleans cuts, scrapes, and bites from spiders, bees, hornets and wasps 1. This is another go-to in our house. 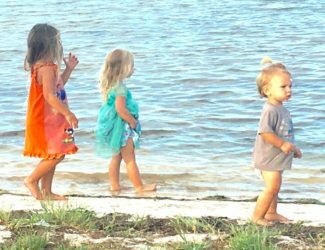 Kids inevitably get congested at some point. I drop this in our diffuser and put it in whoever needs it for the night. I really need to buy another diffuser for those times when multiple family members need it. Uses – Relief from colds, bronchitis, sore throats, sinusitis, coughs, and respiratory congestion. It decongests sinus passages, combats lung infections, and relieves allergy symptoms. 1. Uses-Antiviral, antiseptic, antibacterial, abd anti-infectious 1. Uses – Relieves daily stress and nervous tension, improves mental response, restores equilibrium, promotes relaxation, and lowers hypertension 1. You may notice I use mostly Young Living, but have a couple different brands of oils listed here. There are SO MANY out there, so how do you know which one is best? You can do some of your own research via the amazing Google, and figure out some of the best qualities of oils. 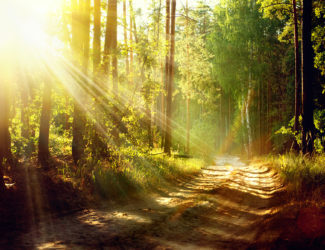 I currently use Young Living, Eden’s Garden, and Nature’s Sunshine. I believe not all are the same quality. If you find an oil super cheap compared to the others of the same type, most likely it is not a good quality. Quality is super important if you want them to work how they are supposed to, and also if you plan to ingest them. (some, not all, can be ingested for different purposes). You have to go with a company you can trust. I personally purchase most of mine through Young Living, and then when I need one quickly I run to our local herb shop and get the Nature’s Sunshine ones. (I have had a good experience with their supplements over the years, and they are trusted by our herb shoppe so I trust their brand). My sister in law uses Edens Garden and gets them online, so I have a few of those as well. I prefer to order oils straight from the source and not from Amazon. The quality isn’t guaranteed when you order from Amazon. If you are interested in Young Living oils, you can order from their siteHERE and get member pricing or retail pricing. (I started with a starter kit last year and it was a great decision for value/cost). 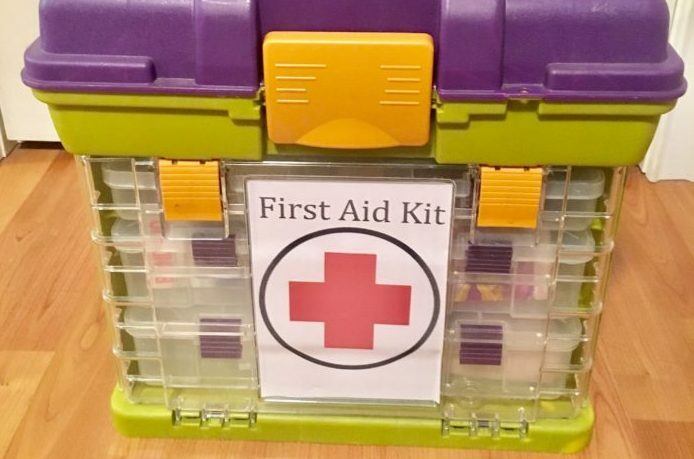 What would you add to this first aid kit checklist for your family? Comment below! Do you have a pdf of the essential oils and blend list? I don’t, but I can make one tonight! Great idea Amanda. Hey Amanda! Just updated to a pdf download of the oils too! 🙂 And I added an oil I forgot- so now there is 11. How could I forget tea tree! So important! How do you use peppermint oil to heal shingles? Thank you for sharing this awesome tips. I love essential oils too. Where did you get ypur container?